I set a little cooking goal for myself at the beginning of 2012. I call it my One New Dinner A Week Challenge +, as you may have guessed, it involves making one new dinner each week that i’ve never made before. I’ve successfully made it through 22 weeks (which means that the year is almost halfway over – where did the time go?!) + it has been such a fun project! I’ve discovered some truly amazing recipes through the challenge, many of which have made repeated appearances on our weeknight dinner menus. And this recipe, which i made last week, will definitely become a staple in our household. While it’s quick + easy to make, it also packs a ton of flavor. The honey-chipotle sauce has a delicious combination of sweet, savory + spicy notes that work wonderfully with the tender, lightly-caramelized meatballs. I served it with garlic + herb couscous + veggies + it was a lovely, healthy weeknight meal. Y’all have to try these – they’re beyond delicious! Preheat oven to 375 F. In a medium bowl, stir the onion, garlic, salt, + black pepper together, then add the turkey to the bowl + use your hands to mix just until combined (do not overmix). Form into 16 meatballs (each will be about the size of a golf ball). In a separate small bowl, stir together the honey, chiles, + vinegar. Set a large ovenproof skillet over medium heat + add the oil. Once it is shimmering, add the meatballs. Cook until browned on all sides, about 10 minutes. This looks good, and I love to do my own meatballs (that way I know what’s in them)! What a great challenge! We’ve got in such a rut with our week night dinners and this looks like a great dish to change that up. Ooh, yum! 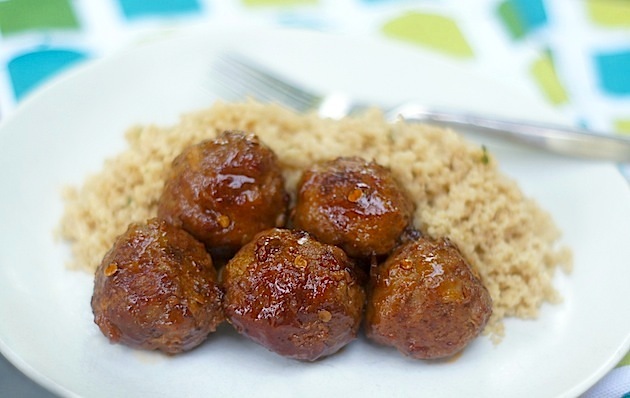 I’ve never tried non-marinara meatballs–and the glaze for these looks really yummy. Plus I’d get to try a new-to-me ingredient with those adobo chiles. I normally dislike meatballs…. but these look really good! This sounds delish – I love chipotle anything. this sounds awesome! i’ve been making teryaki meatballs this year that we love, but they are super salty. i’ve managed to adjust the recipe some to compensate, but even with low-sodium soy sauce it’s just crazy salty. i’ll give these a go next! you’ll have to let me know what you think of ’em, Sarah – we both loved ’em + ate up every last one! These flavors sound perfect for meatballs amy! Love that you used turkey too. Nothing wrong with adding a little health into dinner. What a great challenge – great way to mix things up and keep your meals interesting and fresh. amy, these look fabulous! My mouth is watering just looking at them. Loved that you used ground turkey. Oh my goodness, these sound wonderful!! And I love, love, LOVE the use of the chilis in adobo–you know we like it spicy! We’ll definitely have to give these a try–I’m always on the lookout for easy and healthy weeknight meals! i think you’ll really love these, ashley + since you’re a spicy lover, the 4 tablespoons of chiles will probably be perfect for you. or, you might even want a bit more! these sound so goooooood! i love spicy and sweet. it’s one of those combinations that’s always a winner in my book! the sweet calms down the spice and it rounds it all out! great new recipe, amy! Nice use of the ground turkey! The flavours work so well together and I LOVE the chipotle addition, perfect for some smoky spice! LOL, Amy. We both had meatballs on the brain! Yours look delicious, and I love that they use ground turkey. Bet we’ll both have martinis on the brain later, too. Cheers! Omg these sound fantastic! They’re definitely going on my must try list. Added plus that the recipe is adapted from Martha! yum! love that they are made with ground turkey. I am always looking for turkey recipes. Not as many out there as chicken or beef. Thanks for sharing this one. Amy, I love meatballs, all kinds and these look wonderful. I love your one new meal a week goal. Honey chipotle! Wow! That’s such a wonderful combination, Amy! I must give your recipe a try. The sauce for these sounds super yummy! Pinning. so hungry for lunch already. and I want these! Love the sweet and spicy with savory combo in this recipe! They are droolworthy! I gotta try the honey chipotle sauce. Looks so good! You have such awesome flavors in this dish! It’s definitely going to be made soon. I definitely need to do this challenge. And have some meatballs. perfect! i just defrosted some ground turkey and was hunting around for some good ideas! good timing! will try this this weekend. i say, great minds think alike! heehee! Yummy! I love turkey meatballs and spicy food, so I’m sure this would be a huge hit at our house!! These would make a really great Mexican torta sandwich!! Wow, girl, this looks amazingly tasty! These look amazing amy and I love the flavors you used! YUM!!! Just look at those meatballs! yum! i definitely need to try this! I just started making meatballs a Monday night thing – these sound excitingly rich in flavor, trying for sure!!!! I’ve never tried ground turkey. It’s always just seemed kind of strange to me. Like ground chicken… why would anyone want to do that? Anyway, these look delicious and that sauce sounds great. I like your new dinner a week challenge. That definitely sounds like something I need to be doing! turkey meatballs are the BEST. I love the addition of chipotle here! Sounds like a yummy dinner to try! Sounds sweet and spicy! What awesome timing! My mother and I just ate dinner (last night) at an amazing NYC staple, The Meatball Shop. They have a cookbook, so you should definitely check it out! The balls are so freaking delicious, so if you love this recipe, I know you’ll love the book. I’ve tried to make meatballs at home before, but after my dinner last night + your great post, I think I’m finally going to have to give it a try! you know i’m a huuuuge meatball lover, so i’ll definitely have to check out the cookbook – thanks for the tip! I’m obsessed with anything honey-chipotle lately. I’ve been craving these honey-chipotle wings we usually make during football season, but haven’t been home in my kitchen long enough to make them. These look (and sound) incredible! So uncomplicated & packed with flavor. Bookmarking! I made these last night and they were delicious!!!! I used 3 tablespoons of the chipotle and it was the perfect amount for me. I like spicey but not too spicey. I followed all other instructions to a tee and it worked out perfectly. Enjoy! So glad you liked them, Jackie! I love ’em, too – we make them a lot!